Sarcoptic mange causes intense itching and hairloss. "Mange" is a skin disease caused by microscopic skin parasites. There are several different types of these parasites; the two most common are Demodex mites and Sarcoptes mites. Mange is often diagnosed with a test called a skin scraping. This test is needed to identify what type of mite is present (as the treatment varies) and to evaluate the effectiveness of treatment. 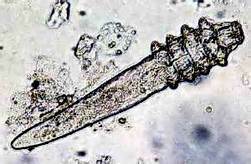 Demodex skin mites are microscopic parasites that can be found in the hair follicles of normal pets and humans. These mites can go undetected unless the infected pets immune system is incapable of keeping the mite population in check- this is especially common in young puppies and immunocompromised adult dogs. Certain pets may be genetically predisposed to demodetic mange. Demodectic mange may either be localized to specific areas of the body or generalized over the entire body. Symptoms may include patchy hairloss (especially on the face, trunk, and legs), skin redness, scaley skin, and possibly itchiness. A skin scraping will determine if demodex is present. Further testing may be recommended to look for underlying disease that would make a pet susceptible to the demodex (especially if the pet is an adult). Treatment is performed with either topical dips or oral medication. The treatment course is often long (several months) to make sure that the disease doesn't recur. Other treatments such as antibiotics may be needed if secondary skin infections are present. In young pets with small localized lesions; these lesions may resolve without therapy. Pets with generalized demodectic mange should not be bred as they may pass on the susceptibility to their offspring. 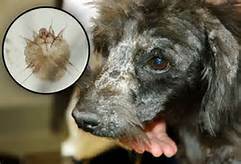 Sarcoptic mange is a highly contagious skin disease found in dogs, caused by the Sarcoptes scabiei mite. These mites will burrow through the skin causing intense itching and irritation. The scratching that results from mange is what causes the majority of the animal's hair to fall out. This is a treatable medical condition, but is highly contagious for other animals and humans. Pet owners are advised to keep the dog quarantined while it is being treated for mange. Symptoms of sarcoptic mange include: intense itching and rash, hairloss, and skin crusts. Pets become infected with sarcoptic mange mites after coming in contact with another animal that is infected. Symptoms usually appear 2 to 6 weeks after infection occurs. Diagnosis is achieved through a skin scrape test. These mites can be difficult to find; however, so if all other reasons for the symptoms are ruled out then successful mite treatment can be diagnostic. Treatment may involve miticidal dips or oral medications, as well as antibiotics, pain relievers, and anti-itch medication. Treatment is often prolonged (several months) to insure that the symptoms don't recur. Humans can become infected with sarcoptic mange mites- especially the young or immunocompromised. The mange mites are not typically capable of completing their life cycle on human skin so infections are self limiting. A physician should be contacted if you have concerns about human exposure.